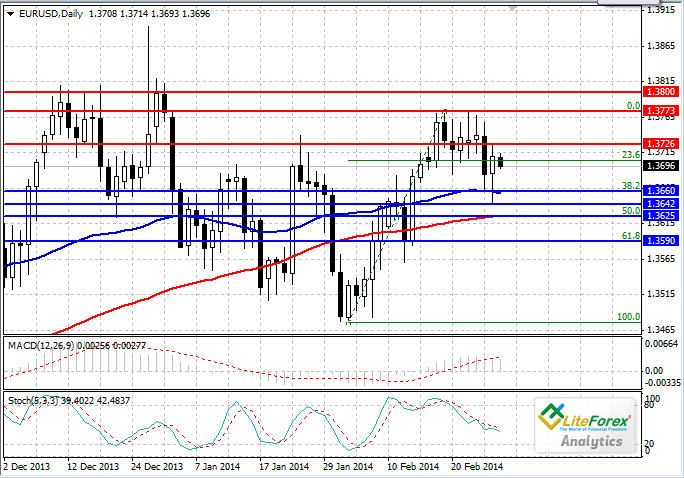 Yesterday the pair EUR/USD reached ten-day highs at the level of 1.3642. Supported to Euro was provided by the rise in German consumer confidence index and the increase in money supply in Eurozone. Consumer confidence index reached the level of 8.5%, which was above the forecast; while money supply increased by 0.1% on annual basis. Unified European currency was also supported by the fading interest in the USD. On the other hand, the pair is under pressure from instability in Ukraine and poor inflation data in Germany (consumer price index rose by 0.5% against expectation of 0.6%). Resistance levels are the local highs of 1.3726, 1.3773 and 1.3800; the latter one is important psychological level. Support levels are moving average with period 55 (1.3660), yesterday’s lows of 1.3642, moving average with period 100 (1.3625) and Fibonacci retracement of 61.8% (1.3590). It is recommended to open long positions after breakdown of the level of 1.3726 with protective orders at 1.3700 and a target of 1.3773.